Huddersfield and Ipswich played out a goalless draw at the John Smith's Stadium that did neither side's hopes of avoiding relegation any favours. The home side had the better of the game with Neil Danns, Lee Novak and substitute Theo Robinson all having chances. Luke Hyam had an effort blocked by Scott Arfield but otherwise Ipswich rarely threatened. It will be seen as two points dropped for Huddersfield boss Mark Robins. However, the former Coventry manager will be heartened by his side's defensive display in this encounter after Huddersfield having conceded 10 goals in his first two games in charge. There was little to excite the fans in the first half, with clear-cut chances at a premium. Arfield's 20-yard effort in the seventh minute was deflected wide by Richard Stearman, before Adam Clayton dragged a shot wide for Huddersfield. Ipswich were evidently trying to get the ball to Michael Chopra as often as possible, but the striker was well marshalled by Terriers defender Peter Clarke. The home side's best chance arrived five minutes into the second half when Novak's shot was parried by Stephen Henderson before the Ipswich keeper managed to keep out Danns's follow up. Huddersfield introduced Robinson, who signed on loan from Derby on Friday, and the striker's pace soon started to cause problems. He should have opened the scoring 19 minutes from time when he was picked out by James Vaughan's pass over the top but he failed to connect with the ball from eight yards. That proved to be the last real chance of the game as both sides had to settle for a point, which leaves Huddersfield three points above the relegation zone and Ipswich one point better off. 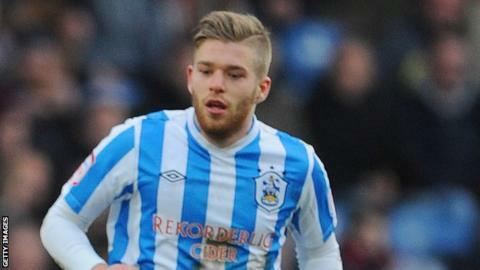 Huddersfield manager Mark Robins said: "They came for a point and got a point. We tried to get all three of them. "There's a little bit of a lack of confidence and the surface doesn't help when you try to pass it but we tried. "We had about seven shots on target and some good opportunities to score but we didn't take any of them. That's why it's only a point and not three." Ipswich manager Mick McCarthy said: "It was two bang ordinary teams on the day, playing on a lousy pitch. But I'll take a point all day long. "It's a good point for us; I've never had a bad point away from home. "We're both nervous, both looking at the wrong end of the table and that doesn't produce wonderfully free-flowing football."